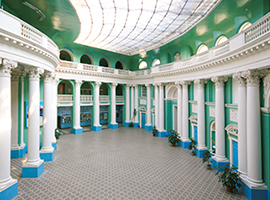 The Biologo-chemical faculty was based in 1900 when in the Moscow high courses for women the natural sciences office was opened and where such outstanding representatives of a domestic science as I.M.Setchenov and K.A.Timiryazev gave lectures. There began the teaching activity V.I.Vernadsky. The foundation of the famous biological collection which has become later the Darvinian museum laid by A.F.Kots during his work on MHCW. In office of natural sciences many scientists taught and lectured, and they were classics of Russian science: outstanding ornithologist M.A.Menzbir, the zoologist P.P.Sushkin, geneticist N.K.Koltsov and others. 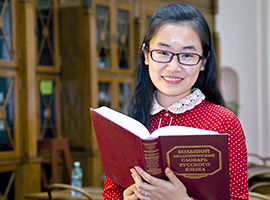 The traditions of Russian school of the higher education got the new development in Soviet period. At biologo-chemical faculty conducted scientific and pedagogical work such leading biologists as the academician M. S. Gilyarov, professors S. P. Naumov, A.A.Uranov, A.V.Mikheyev, F.N.Pravdin. There was created the structure of subject chairs which fully provided the preparation of highly professional pedagogical and scientific staff. On the zoology and darwinism chair, under the direction of professors S. P. Naumov (1905–1982) and A.V.Mikheyev (1907–1999) were created and successfully developed such scientific directions as ecology of birds and mammals, seasonal migrations of birds; under the guidance of the academician M. S. Gilyarova – soil zoology. Under the guidance of professors A.A.Uranov, T.I.Serebryakova, I.G.Serebryakov there were created such scientific directions as ecological and population morphology of plants. The founder of the scientific direction on studying of regional florae is professor A.G.Elenevsky. The chair of teaching methods of biology, which the famous teacher, the organizer of biological station of naturalists B.B. Vsesvyatsky, guided and played an important role in methodical applied preparation of students. The big group of professors and teachers worked at the chair of the general and inorganic chemistry under the direction of professor S.A.Balezina. «Corrosion of metals» was the main subject of scientific researches of chair. Many years the chair of organic and biological chemistry were headed by the honourable professor of MSPU Y.B. Filippovich, the founder of scientific school «Biochemistry of insects». The researches of the chair of anatomy and human physiology and animals were directed on studying the functions of visual and other analyzers, age physiology, the morpho-functional organization of nervous system. There are 7 chairs in the faculty’s structure: botanists; zoology and ecology; anatomy and human physiology and animals; agriculture bases; techniques of teaching of biology; general and analytical chemistry; organic and biological chemistry. At chairs the educational scientific centers work: biological «Ecology and biodiversity»; chemical «Inhibitors of corrosion of metals»; biochemical «Biochemistry and molecular biology of Y.B.Filippovich»; physiological «Age physiology». Commonwealth of independent states (CIS) regional flora and biodiversity of taxa. Morpho-functional organization of the plants and their populations in the cenosis of varying degrees of disturbance. Functional problems of morphology and systematics of plants in university and school teaching. Physiological basis of health preservation. Methods of improving work. Acupuncture system to ensure functioning of the body. Physiological health problems of students with regard to their age differences in educational institutions. Of growth and development. Age adaptive transformation of the central and peripheral nervous system of humans and animals, neurohumoral regulatory mechanisms of the cardiovascular system. Study monoaminergic mechanisms regulating brain function. Investigation of mechanisms of binocular vision. Structural and quantitative studies of neuroglial relationships in the human cerebral cortex and primates. The role of biologically active substances (amino acids, peptides, including opioid, biogenic amines, protein inhibitors) and certain xenobiotics (halogenated aliphatic and aromatic) in the regulation of life processes of plants and animals. The problem of integration of natural sciences in the school environmental education. Research of problems of teaching organic chemistry and changing the content of the subject and its teaching methods in education departments in accordance with modern knowledge and changing needs of the school. Ecological and biochemical control of biological active substances, toxic chemicals, and physical environmental factors on biological objects. Studying of influence of soil and ecological factors on activity of plants. 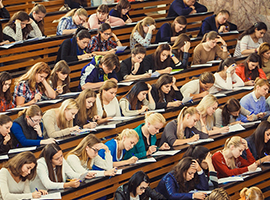 Scientific and methodical researches of teachers of chair are connected with improvement of the maintenance of a school course of biology and a technique of its studying, preparation of students for work at school. The studying of influence of insoluble products of corrosion on adsorption and efficiency of effect of inhibitors of corrosion. The student’s scientific circle at the chair of zoology and ecology exists since 1948. The head of the department and its founder is professor S. P. Naumov – the large zoologist who engaged the ecology of trade animals. The modern student circle continues long-term traditions. The subjects of the lessons are extremely various. It is a discussion of various aspects of zoology, ecology and biogeography, reports of students on the scientific researches, and also a practical training with scientific zoological collections. One of the oldest traditions of the circle of zoology of vertebrata is the organization of student’s scientific expeditions in winter holidays. Students of different courses of biologo-chemical faculty take part in work of a chemical circle. Generally the plan of work of a circle covers interests of students of the 1st course. On the lessons of the circle the modern problems of inorganic chemistry, including difficult questions of the current training program for first-year students are popularly stated. In 2007-2008 the faculty participated in IEP implementation (an innovative educational program) of the university. During this time and scientific funds of faculty were updated, the new equipment for educational and scientific work was bought, the range of researches of teachers and graduate students extended with active participation of the students doing course and diploma works.At the faculty are created and equipped with the new equipment 5 scientific interdepartmental laboratories: complex zoological laboratory, biochemical laboratory, biotechnology Laboratory, physiological laboratory, scientific center «Inhibitors of corrosion of metals». On the chair of organic and biological chemistry of biologo-chemical faculty within activity as a part of NOTs «Nanotechnologies» MSPU scientific researches on the following directions are carried out: Researches of the genomic and proteomny organization of a silkworm and other species of insects accompanying the person (a cockroach, a mosquito, etc.) ; Studying of interactions a bacteriophage cage and their values for ecology of microflora of the person and animals; 3. Within a grant of the President of the Russian Federation the molecular and genetic analysis (with the use of methods of gene engineering and PTsR-analiza) parthenogenetic (unisex) and bisexual species of the Caucasian rocky lizards of the sort Darevskiana is carried out. On zoology and ecology chair within the scientific direction on studying antropogenno the broken communities and with support of a number of grants of the Russian Federal Property Fund studying of the direction and intensity of ecological processes in the natural and broken ecosystems is carried out. On anatomy and human physiology chair and animals within the scientific direction «Physiological basis of health preservation» researches of physiological processes with the use of the new equipment without direct contact to experimental object (rats) in a continuous multidaily mode are carried out. On the chair of the general and analytical chemistry the analysis of conditions of formation of metallouglerodnovy compositions on the basis of use of polymeric materials (polyacrylonitrile, polyethylene, etc.) put on a metal surface was carried out. Evening of the English drama and poetry. The Biologo-Chemistry faculty actively participates in the competitions which are carried out within University. In 2010-2012 volleyball teams of girls and the young man won the University championship on volleyball. The faculty team on badminton took the 3rd place in the University championship. Following the results of participation in sports competitions the biologo-chemical faculty took the 3rd place in a sports contest MSPU.